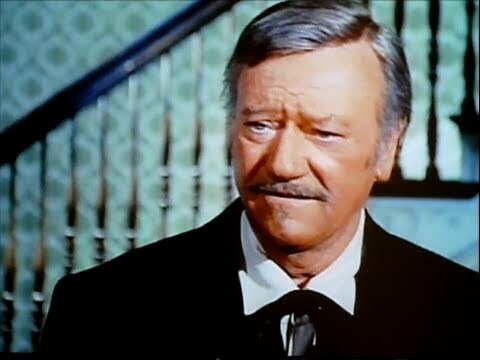 THE SHOOTIST has Lament looming large, famous as John Wayne’s final film. Story, cutting to chase: the last week in the life of a legendary gunfighter—dying of cancer— brings forth new friends and old foes, culminating in a ‘boots’ decision— on or off? Take a guess. Decently reviewed upon its 1976 release, today it’s regarded by many as a minor classic, which it seemed to set out to be, what with the ailing 68-year-old Wayne’s real-life cancer history framed against fifty years in the movies. He’s backed by a cast of old-pro friends, a low-keyed Elmer Bernstein score, sunny but winter-chilly locations (Carson City, Nevada) and a times-are-changing setting in January of 1901. The West’s horses are shoved aside for streetcars, Duke has yielded the passing lane to Eastwood. 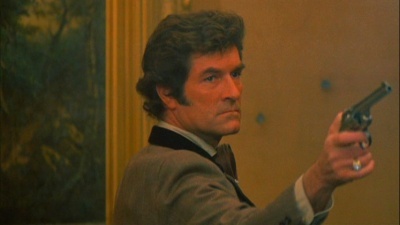 In a baton-handover of sorts, Clint’s five-time director Don Siegel and 11-time cinematographer Bruce Surtees add their touch to this valediction. Bernstein’s quiet score was his last of eight Wayne vehicle varnishes. Those Elmer efforts wove an arc from the surging ebullience of 1961’s The Comancheros—stereo-phonically declaring the West wide open for manly adventure—to this sadness-tinged arrangement signaling closure, not just of this particular storyline, but of a larger piece of Americana proper, and the inevitable farewell of its most successful ambassador. The movie doesn’t quite reach the strained-for immortality branch: even within its small scale, at a standard 100 minutes it seems a bit short. Scatman Crothers and Harry Morgan ham it up too much. But most of it works, with some moments of neatly underplayed emotion. Lauren Bacall is quite good, no doubt channeling some of her own cancer trial from late husband Humphrey Bogart. Ron Howard is fine, Hugh O’Brian cool as ever. Sheree North has an energetic cameo, and the great John Carradine shows up as an undertaker—dependably decayed, like a valentine to vultures. Plus you get James Stewart, brief but telling, as the doctor who gives Wayne’s character the bad news: one Hollywood Western Great to another. Reliably crusty Richard Boone and Bill McKinney are on hand. The art direction was Oscar-nominated. Hugh is strict when it comes to the whole Accusations Issue. All are at the service of The Duke, and he goes out with dignity. Along with 1972’s The Cowboys (also in the farewell-fold), this was Wayne’s best acting in a decade; rather than coast on his persona, he put his heart in it. To see him work with this quiet, winning blend of relaxed authority, you’d have to go back to 1965, to In Harms Way; before cancer, before he lost half his audience over politics, Vietnam and The Green Berets, before spaghetti westerns and Sam Peckinpah shot the Old West(erns) in the back. Wayne detractors can’t forgive him his stances or style, but even they grudgingly nod to his work here. As to the die-hard Duke legions, it’s a no-brainer. I appreciate this more now than when I first saw it three decades back. At the time, I thought it was ‘good’, but that was as much out of fan loyalty as admiration (his recent tired spate had all been sub-par). The $8,000,000 production came in a muted #50 for the year in the States, eventually pulling around $14,000,000 worldwide. Watching it recently, I teared up during the farewell scene with Bacall, and the perfect ‘last stroll into the saloon’. Maybe that’s because now I’ve logged enough saddle time to fully accept that no-one lives forever, not even John Wayne. Feo fuerte y formal. 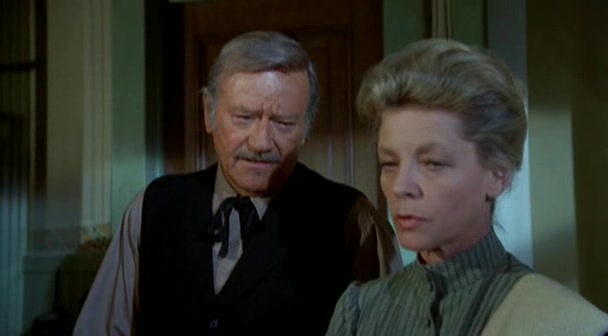 I last watched The Shootist three years ago when Lauren Bacall died and was pleasantly surprised how well it held up. A dignified and fitting way for The Duke to bow out!